North Korea and South Korea will hold their third high-level summit in September. 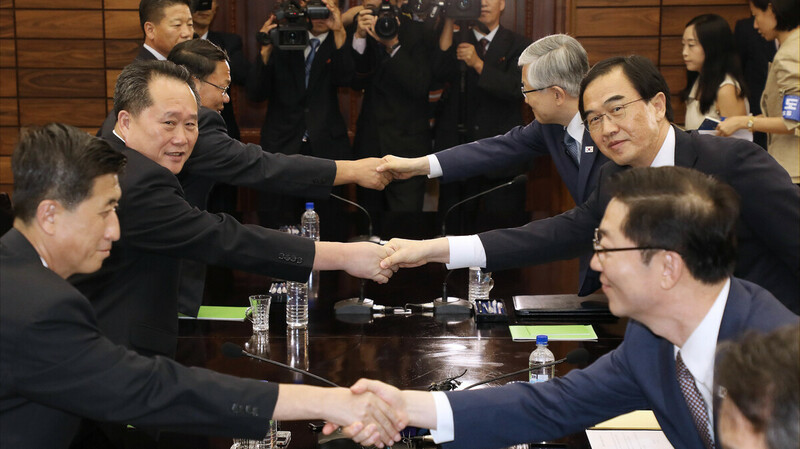 The meetings were agreed to at a meeting of South Korean Unification Minister Cho Myoung-Gyon, second from right, who shook hands with his North Korean counterpart Ri Son Gwon, second from left, after their meeting in Panmunjom. The announcement comes two months after President Trump met with Kim Jong Un in Singapore for a summit that generated promises of denuclearization on the Korean peninsula and improved relations — as well as skepticism over the two longtime enemies' willingness to recast their relationship. North Korea recently returned the possible remains of U.S. troops from the Korean War. But questions remain over how far the country will go to idle its nuclear weapons program. While a cease-fire exists between the U.S. and North Korea due to an armistice, the two governments never agreed to a permanent peace agreement after the Korean War. "Pyongyang appears to want a speedy declaration of an end to the 1950-53 Korean War," reporter Michael Sullivan says from Seoul. "Washington wants North Korea to be more forthcoming about its nuclear weapons stockpiles, production facilities and a timetable for getting rid of them." North Korea demolished a nuclear test site in May, and satellite images appear to show that the country had also begun dismantling a missile site — but in late July, reports emerged that North Korea is building new ballistic missiles at a factory just outside its capital. Last week, North Korea complained that some high-level U.S. officials were "going against the intention of President Trump" by sticking to "old scenarios" and taking a hard line on maintaining sanctions on the country. Details of the new summit's timing are not yet public. As The Korea Herald reports, on Sept. 9, North Korea will celebrate 70 years of existence under the regime that was founded by Kim Jong Un's grandfather, Kim Il Sung. Next weekend, the two Koreas will continue their program of using sports to bring their countries closer together, as they plan to send a united basketball team to the Asian Games being held in Indonesia. The basketball team follows in the steps of the unified women's ice hockey team at the Pyeongchang Olympics.